Teamsters at the City of Rancho Cucamonga’s Department of Public Works overwhelmingly voted to ratify a new contract on February 4, averting a possible strike. The one-year contract secures the approximately 100 employees in the Department their first true raise in almost 8 years and as well as significant improvements to the grievance procedure. The workers perform daily maintenance of City streets, facilities, parks, and even community spaces at Victoria Gardens shopping center. The group worked hard to stand together during a yearlong negotiating process. The members went on to authorize a strike if needed in July 2018. 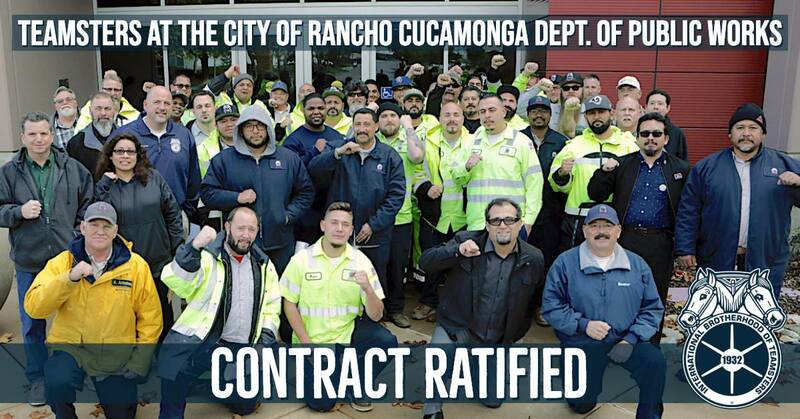 Ultimately, Teamsters Local 1932, at the negotiating table secured a fair deal on January 30, 2019, and the now-ratified agreement will go to the Rancho Cucamonga City Council for approval on February 20.